Using content tools for analytics is fundamental for analyzing and measuring your online marketing efforts. With the help of these tools, you can evaluate the performance of your online content and understand which types translate into sales. Successful content marketers use the data provided by these tools to create effective content marketing plans and you should too. With the multitude of online platforms, the variety of analytics tools is great. To choose the right tool, consider the type and size of your business, your online business platforms, the exact metrics you’d like to track, and your budget. 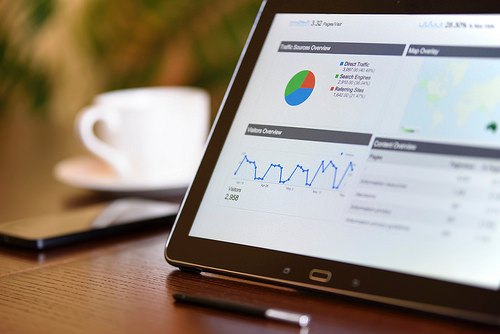 There are several categories of analytics tools: website analytics, social media analytics, SEO (search engine optimization) analytics, and funnel analytics. Each category analyzes different areas of content performance. Website analytics tools give you insights into people’s behavior on your website and help you identify any weak points in your content. They can even offer strategies on how to make your content more appealing to readers, whether it’s accomplished by adding an infographic to your webpage or by covering a topic in greater detail. Social media analytics measure your content performance on social media platforms. They’re valuable for anyone who utilizes these platforms for promotion. The data gathered by these tools can be translated into specific advice. You could learn the best time to post on Instagram for getting the most views, what kind of information is popular among your audience, and whether your efforts lead to more subscribers and sales. Funnel analytics tools evaluate how different types of content affect your customers during their buyer’s journey. They help identify patterns that either lead to a sale or cause a sale to fall through. SEO analytics provide valuable data that allows you to optimize your content for various search engines. The following is an overview from each category’s best content tools for analytics. Webtrends: This tool collects real-time data about customers’ behavior on your website and social media platforms. It also allows you to segment your users by age, location, and other categories while creating content specifically for the purpose of targeting these groups. Its SEO and A/B testing tools help determine how strong your website content is and whether your marketing on social media is effective. Webtrends offers stellar customer support with email and phone consultations, numerous video tutorials, and webinars. Their packages start at $154/month. Hotjar: With this tool, you can watch how users behave on your website in real time. You can see how long they spend on each page or post, what pages they scroll down the most, and when they leave. Such information is essential for understanding what content your users prefer. You’ll gain valuable insights that can help you tailor your content to your audience’s interests and enhance the users’ experience on your site. Pricing starts at $29/month. CrowdBooster: This tool shows you the big picture of your business performance across different social networks. You’ll get statistics about content sharing and traffic generation, subscriber growth and interactions, and even tips on the best times for posting your content. The starting price for this tool is $9/month. Crimson Hexagon: This analytics tool evaluates posts on various social media channels and offers you daily statistical reports about topics that interest your users the most. Contact the company for a price quote. Tweriod: This free tool analyzes the tweets of your and your followers. It then determines the best time of day for tweeting in order to reach as many people as possible. Google Analytics: This is a free, versatile tool that’s great for not only measuring traffic on your website, but also analyzing social media campaigns and tracking customer conversions. ShortStack: This app is for running social media contests. It also analyzes the performance of your contests and identifies the ones that resonate with your audience the most. The tool works with Facebook, Instagram, and Twitter and it’s recommended for companies that run regular social media contests. It has a free version along with paid plans that start at $29/month. TapInfluence: This is an influencer-marketing platform that helps you identify potential influencers to collaborate with. It’s also a great tool for managing and analyzing your campaigns. It works with Pinterest, LinkedIn, Facebook, Twitter, Instagram, and YouTube and it’s ideal for businesses utilizing large-scale influencer-marketing campaigns. Contact the company for pricing options. SqueezeCMM: This tool performs basic analysis and conversion measurements that calculate the ROI (return on investment) of your marketing content. It evaluates the performance of different types of content at all stages of the buying cycle and determines which content is best at moving sales along. You can also learn which of your social media platforms bring in the most clients. The price for this tool starts at $499/month. MarketMuse: This software analyzes keywords and proposes a tailored keyword strategy on how to optimize your content for search engines. It also has a site audit tool that analyzes your website and provides you with a detailed report on how well different topics are covered. Contact the company directly for prices. Keyword Juicer: This unique software, built by CopyPress for their clients, allows you to identify your potential campaigns, along with the value they could generate. You can also monitor your growth by implementing the proposed strategies. The tool extracts all of this information by comparing various keyword combinations. The pricing starts at $399 for a 12-month commitment. 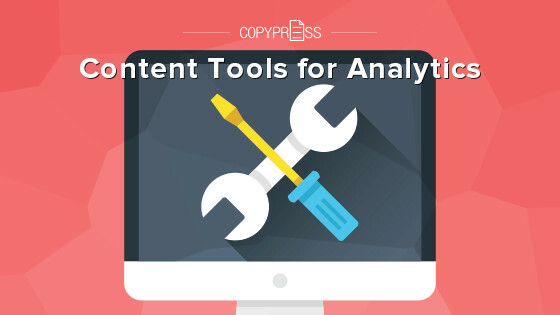 Hopefully, this breakdown and review of various content tools for analytics will help you choose the tool that is right for you. These tools can be invaluable in your efforts to run successful marketing campaigns. The insights you gain from using analytic tools will help you create more powerful content, maximize your content’s reach, build your brand awareness, generate more traffic to your website, and increase your sales conversion rates.